AKIPRESS.COM - After five days of action, Turkmenistan emerged as the most successful country in the Asian Kickboxing Confederation (WAKO Asia) Championships 2016/17 at the Martial Arts Arena in the Ashgabat Olympic Complex on Sunday, Laurel news services said. The home country won a total of 27 gold, 25 silver and 23 bronze medals to lead the medal table, while Iran, with 22 gold, nine silver and 12 bronze followed. The host added a mammoth 25 medals — 13 gold and 12 silver —to its collection on the final day. Iran was the second most successful team on Sunday, bringing in nine gold and three silver medals. 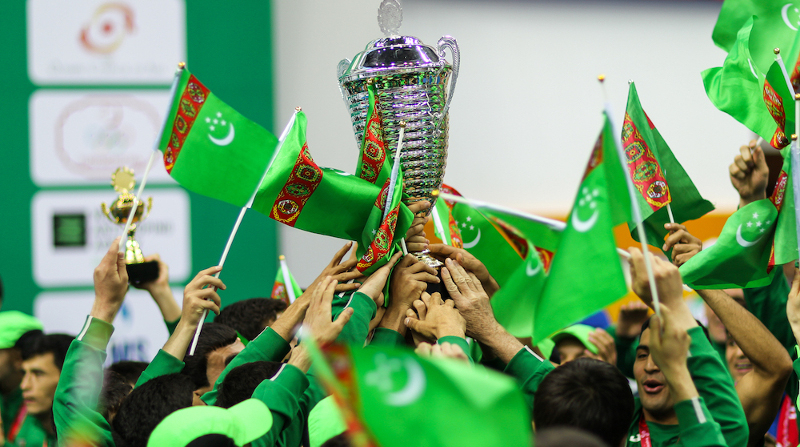 Turkmenistan’s Gulzada Jorakulyyeva had a sensational tournament. She won two gold on the last day, in the 65kg low kick and full contact categories, to take her final tally to three gold medals. Jorakkulyyeva had made the kick light title her own on Saturday. The 18-year-old was the joint most successful athlete of the five-day Championships, but remained humble. Four kickboxers from Iran and a Turkmenistan athlete completed double gold medal hauls on the final day. For Iran, Majid Akbarzadehmoshtadhi (men’s 84kg light contact and point fighting), Fotima Kholova (women’s 50kg kick light and light contact), Zeinab Jabbari (women’s 65kg point fighting and light contact) and Shahnaz Mirheidari (women’s 60kg point fighting and light contact) achieved the double. The host’s Batyr Charyyev (men’s 94kg light contact and kick light categories) also claimed victories in all bouts he fought in. Kholova, who won both her final fights by identical 3-0 margins, said she was happy with her overall performance in the competition. Turkmenistan and Iran were the top two sides in the final medals standings, followed by Tajikistan (12, seven, three), Kyrgyzstan (eight, 11, 12), Iraq (three, two, seven), Syria (two, one, six), India (one, 10, 23), Macau (one, three, four), Jordan (one gold), Chinese Taipei (four silver, five bronze), South Korea (two silver, three bronze), Afghanistan (one silver, three bronze), Malaysia (one silver, three bronze), Nepal (one silver, one bronze), and The Philippines (two bronze). The Asian Kickboxing Championships were a part of the Inspiring Ashgabat Test Event Series, which also included the Senior Asian Weightlifting Championships and the Central Asian Short Course Swimming Tournament. The three tournaments were held between April 23 and 30.